A musical celebration of the 100th anniversary of the kibbutz movement, a meeting with the deputy mayor of Jerusalem and a visit from the president of Israel were highlights from my three week placement with the Society for Preservation of Israel Heritage Sites (SPIHS). As part of my postgraduate programme in Conservation Studies of Historic Buildings at the University of York, I observed the conservation activities and policies of the country and completed research for my dissertation on conservation planning. SPIHS, created in 1984 as a non-governmental organisation, advocates for the protection of historic buildings and landscapes throughout the country. The society is divided into geographic regions with each area under separate management. I had the privilege of working under district managers, Tamar Tuchler and Isaac Shweky, from Tel Aviv and Jerusalem respectively. There were similarities in the conservation approaches within both cities as both engaged community residents, business owners, and political leaders in the identification of areas of historical value, develop plans for their immediate care and long term conservation needs. In Jerusalem, several projects are underway including historical research and protection of the Jerusalem Central Prison, a museum (fig. 1). 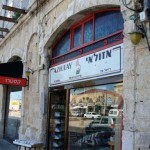 Another is the regeneration of the Street of the Prophets which incorporates a well known market area within the city. 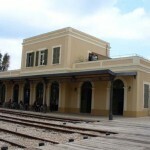 While in Tel Aviv I was fortunate to observe the adaptive reuse of the Old Train Station (fig. 2) near the coastline of the city. The society is currently collaborating with management to develop future conservation measures for the site. Numerous architectural elements in the Israeli landscape were built during the British mandate period, 1917 to 1948. 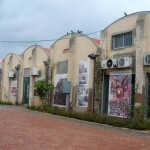 In Rosh Ha’Ayin, a city near Tel Aviv, several British military buildings are still standing (fig.3). With the aid and direction of Yiska Raveh, a freelance historian, SPIHS is investigating the significance of the buildings. Through a search of the United Kingdom National Archives, the British Library and newspaper repositories, I located documents and articles for further research. 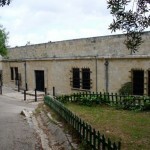 The buildings are in varying stages of repair and reuse. The hope is to renew interest in the architecture and encourage its conservation. 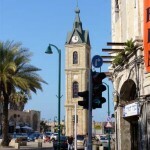 For my dissertation research, I journeyed to Jaffa near Tel Aviv to where a regeneration project was recently completed. The area, a long time commercial centre, was transformed by restoring its historic architecture. A significant aspect of the project was the signage for the individual stores. Initially, each business owner wanted to protect the image of their store by keeping their original signs. With encouragement from the project’s conservation architects, an agreement was made to create signs to fit the architectural scale of the buildings’ exteriors while retaining the unique design of each store (fig.4). Another iconic feature of the area is its clock tower pictured in figure 5. My time in Israel was beneficial in many ways. Not only was I able to gain a clearer understanding of the conservation of historic buildings in the country, but also a deeper knowledge of the society and culture. With each conversation, whether speaking with a political leader, architect, or local historian, the message was the same. Conservation of the architectural heritage of Israel is valuable to its citizens. Like other forms of cultural expression, the preservation of heritage appears to transcend language and borders. Although a young country, the history of the people of Israel is quite long. There is much to preserve and the people are passionate about relating this history, structures and places, to an international audience. On July 15th this year a small group of 5 undergraduate and postgraduate students of University College London (UCL) travelled to Israel to join the excavations at the Bronze Age site of Tel Bet Yerah on the Sea of Galilee. I am to start my Masters in the Archaeology of the Eastern Mediterranean and Middle East this September with UCL and was lucky enough to be able to participate in this year’s excavations thanks to the generous grant from the Anglo-Israel Society. Led by Dr David Wengrow from UCL, we joined the core project team of staff and students from Tel Aviv University and students from the University of California, Los Angeles (UCLA). As one of the earliest urban centres of the Jordan Valley during the Early Bronze Age, Tel Bet Yerah is a hugely important site. It has played a particularly important part in research into the transition from village to urban life in the late fourth and third millennia BC. This year the British team were excavating domestic areas in close proximity to the famous Circles Building in Area SA, supervised by PhD student Sarit Paz of the University of Tel Aviv to help her with this research. Excavating a Tel site is slow work requiring a great deal of care. We generally use small tools and must frequently clean as we go in order not to miss anything. Digging in Israel in July is physically draining work, so work is at a fairly slow pace! However in just the two weeks that our team were on the excavation we made good progress and some interesting discoveries. Some of our discoveries may prove important in helping to substantiate existing theories. Sarit Paz is investigating the settlement of Early Transcaucasian (ETC) migrants at Tel Bet Yerah during the 3rd Millennium BC. It is thought that there was some kind of unknown crisis at the end of the Early Bronze (EB) II which led to the complete or partial abandonment of the city. The ETC migrants are thought to have arrived after this and to have established themselves in the unoccupied or partly abandoned settlements. The discovery of Khirbet Kerak Ware (KKW) pottery is thought by many to be evidence of this migration. Sarit Paz believes that because they simply re-used existing buildings, did not build fixed hearths or benches and did not produce large non-portable storage vessels suggests that they never really established themselves or settled properly. This season I was mostly excavating inside a domestic building at EBII levels in which I found no KKW pottery, as expected. However I did discover a pit cut into the EBII levels which appears to have been dug by the ETC ‘migrants’ as it contained lots of KKW. Interestingly in the pit I also discovered a large quantity of daub with reed imprints. This is interesting because the EBII people did not use wattle and daub; they constructed walls from mud bricks. Wattle and daub is a lot quicker to construct and could be said to make a more temporary structure than mud bricks walls. Therefore not only does this discovery suggest that these ETC ‘migrants’ were notably different to the EBII people, it also might support Sarit Paz’s theory that these people perhaps did not see themselves settling here permanently. Whilst digging in this area we also discovered lots of collapsed mud bricks that had fallen, sometimes in large chunks of bricks, quite a distance from the original walls. This might strengthen support a common theory that the crisis that caused many, if not all, of the people to leave may well have been a massive earthquake. I also discovered in this area fragments of a beautiful, delicate alabaster vase which can only have come from Egypt. This is interesting because one of the British students Mike Lewis found a part of Egyptian palette in this area last season which is of very high quality comparable to royal cosmetic palettes. These discoveries along with other previous discoveries in Tel Bet Yerah and Egypt suggest possible interaction between the Egyptian court and the Early Bronze Age town. In other discoveries by the British team this year were the continuation of a very well preserved, in situ, internal pebble floor and another KKW pit containing very well preserved organic material including grains which should produce some interesting information. The site director Rafi Greenburg, Sarit Paz and all the Israeli students were exceptionally welcoming and helpful and made it a fantastic experience for all of us. They have said that we are more than welcome to return as the excavations will continue to run each July so hopefully we will return in the near future! My trip to Israel in June of 2008 had the goal of furthering my PhD research on storage jars imported to Egypt from Canaan between 1750 and 1550 B.C.E. Specifically, I am studying jars known as Canaanite jars in order to better understand the trade and political relationships between Egypt and Canaan during the Middle Bronze Age (2000-1550 B.C.E.) and Late Bronze Age (1550-1200 B.C.E.). Canaanite jars have been found throughout the Eastern Mediterranean, including Crete, suggesting their importance in international trade. The study of the jars is accomplished through making thin sections of the ceramics and examining them under a microscope, called ceramic petrography. Through this analysis the minerals in the pottery can be identified that will assist in suggesting possible localities for production. By utilizing detailed geological maps of Canaan, areas that contain the correct outcrops to produce all of the inclusions in the pottery can be identified. The visit to Israel was undertaken in order that I might work with Prof. Yuval Goren of Tel Aviv University. Prof. Goren is widely known for his work examining the ancient ceramics of Eastern Mediterranean cultures. His previous work on the Late Bronze Age Canaanite jars and the Amarna tablets produced in Canaan meant his expertise was invaluable for discussing the possible areas of manufacture for the material I am studying. Additionally, Prof. Goren has a large collection of comparative material from all over Canaan that I utilized to locate any ceramics made of similar material to the MBA Canaanite jars. The results of our collaboration suggest the jars were being produced mostly along the coast of Lebanon and northern Israel where there are several important MBA sites that must have had political connections to Egypt. Prof. Goren ensured my first trip to Israel was a wonderful and unique experience. Not only did I spend much time in his laboratory learning more about methods for conducting ceramic petrography and having fruitful discussions with his students, but he also planned trips for me to see more of Israel. Our first adventure was to visit the underwater excavations being carried out in Haifa Bay. We snorkeled over a shipwreck that is being excavated to determine if it was a part of Napoleon’s fleet. Although little could be seen due to the turbulent water, we did examine some of the artefacts and pieces of wood brought to the surface. As we returned to Tel Aviv, Prof. Goren and I collected sand at several beaches to help us in studying pottery that was manufactured from coastal sands. Shortly before I left, I had the chance to spend a day in the Old City of Jerusalem to see the West Wall of the Second Temple, the Temple Mount, and the Church of the Holy Sepulcher. I also spent time in the archaeological park and of course the bazaar. Thus, my research trip to Israel was an educational experience all around in that I learned a great deal that has contributed to my dissertation and had the opportunity to experience the culture and history of Israel. The excavations at Megiddo in northern Israel’s Jezreel Valley are being carried out by the Megiddo Expedition of Tel Aviv University under the directorship of Israel Finkelstein and David Ussishkin of Tel Aviv University, and Eric Cline of the George Washington University, USA. During the 2008 season at Megiddo, four areas are being excavated: J, an Early Bronze Age cultic area; K, a Middle Bronze Age domestic area; H, a Late Bronze-Early Iron Age palace area; Q, a new area which aims to investigate the Late Iron Age. The main reason to excavate in Area Q was to investigate different problems and different levels than those encountered elsewhere on the mound. The Late Iron Age has been somewhat neglected by the recent excavations, and the excavation of Area Q helps to rectify this. This area had been partially and superficially excavated by the Oriental Institute of Chicago team in 1926, but it was felt that there were many unanswered questions, for example concerning the positioning of the Iron Age city walls. The uppermost levels excavated in the first session of the 2008 season were those from the 1948 war, including gun emplacements. A number of cartridges were found littering the area, both live and spent. During this conflict, there were two battles at Megiddo itself. In the first battle, the Israelis took over the mound that had previously been held by the Arab armies. In the second battle, the Iraqi army attacked, but the Israelis held the position. The level beneath this would appear to be the OIC stratum 4 level, which had been exposed by the OIC, meaning that there were hardly any floors to be found in the current excavations, and nothing sitting on the floors. A number of buildings were found, some of which had later been partly modified. Beneath this lay Stratum 5, which included pottery and some floors. It had been hoped that the last Iron Age city wall would be found, as seen in Areas K and H, but it appears that the wall has been destroyed completely and is therefore no longer visible. The future of the area will be to concentrate on investigating the upper layers (OIC layers 4 and 5), and possibly OIC level 6. When this level is reached in all squares, the excavation will spread out sideways rather than going deeper, in order to investigate this level more intensively. I began excavating under the supervision of Norma Franklin and Eric Cline in Square G6 in Area Q. We encountered a number of interesting finds in the 1948 level, including ammunition and an Ottoman coin. Most exciting, however, was the find of part of a Late Bronze Age anthropomorphic figurine (although the presence of this in what was otherwise an Iron Age level can probably be attributed to the digging activities of the square’s resident gopher!). During my three weeks at Megiddo I learnt a great deal about the current excavations at the site, as well as the history of excavations, and these subjects form a prominent part of my PhD research. I am very grateful to the Anglo-Israel Archaeological Society and to the Megiddo Expedition of Tel Aviv University for giving me the opportunity to excavate at Megiddo.